*Another monthly post that is way more than a month late. Ha. Whatever. 9 months. 3/4 of a year. 75% of his first year of life has already come and gone and I just can't believe it. What was life before you little one? What did I even do with my "free" time? When I look at his monthly pictures, I am in shock at the difference between 8 and 9 months (or maybe more like 10 months in this picture, I'll never tell), but regardless, he is looking less and less like a baby each day. The older he gets, the more his little personality shines through. 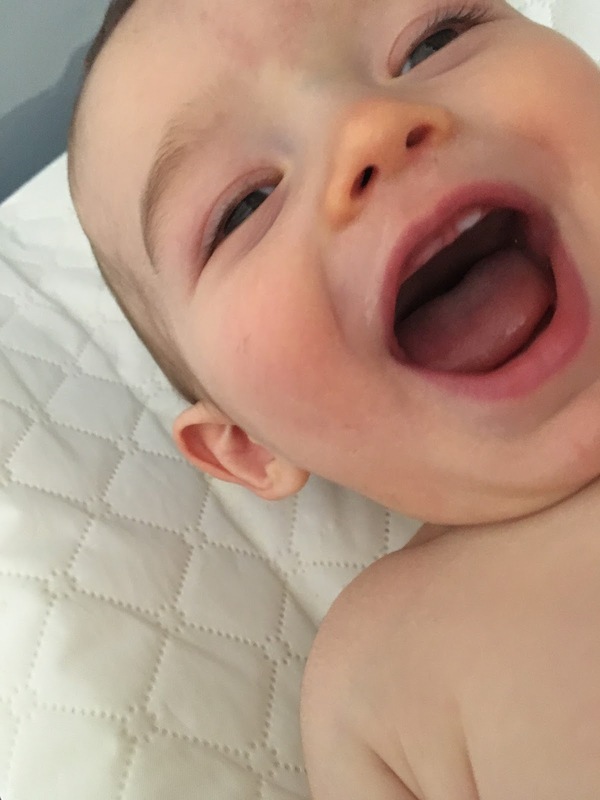 He is a happy, happy baby, but he certainly knows what he wants and makes sure he lets us know. Drew and I always talk about him having grit. Aiden better watch out because Alder is not going to let him get away with a single thing! Even though he can't always say what he wants, he has his mind on something and won't stop until he gets his way. I think we are in trouble. Haha. His current nickname is Big Baby and he is often portrayed by his brother as the villian as he is always knocking things down or taking Aiden's hot wheels and putting them in his mouth. Oftentimes, Aiden will run away in the hopes of being chased by his brother who is newly crawling and he will yell "Oh no, here comes Big Baby!" Alder's very favorite thing is to "chase" his brother. They laugh and laugh and laugh. It is hilarious and gives me a glimpse into life with two very active and mobile boys. Lord help me. He is making so many new sounds: lots of grunting and "yelling" at us at the dinner table and lots of squeaks when he is excited! He started saying words too! His first word was "WOW!" And he would look at something, point with his finger (like in the picture above) and say "WOW!" Then it was bye, bye followed quickly by "Mama" (Melt my heart) and then my favorite sound, "UH-OH." When any one drops something we quickly hear, "UH OH" and it is the most adorable sound in all the world if you don't count his giggle. This kid puts away food like you wouldn't believe. He is a big eater so thankfully he is able to feed himself because I couldn't spoon food in his mouth fast enough! He can sign more, but often times chooses to grunt at us instead. His favorite foods right now are pumpkin risotto, sweet potato eggs, steamed sweet potatoes, oatmeal and bananas (always bananas.) 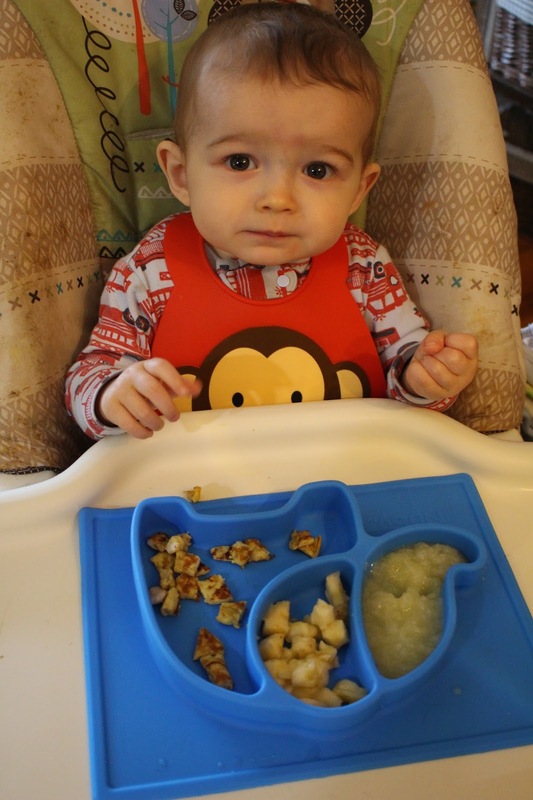 If you need a simple breakfast idea for a 9-12 month old, take 1 banana, mash it up and add two beaten eggs. Mix and pour like pancakes on a hot skillet. It is crazy how much these resemble the texture of pancakes and Alder gobbles them down! If all Alder wanted for Christmas were his two front teeth, then his wish has been granted. He now has his top two and bottom two teeth and his little grin is just the cutest thing ever! Some other milestones this month...he celebrated his first Thanksgiving, had his 2nd airbnb stay (did not go well sleeping in the pack and play), celebrated his first early Christmas and met lots of Aunts, Uncles and cousins! And the best milestone of month 9...he is now sleeping through the night! It took a nudge from Dad to make me have him cry it out, but it took a total of an hour and 15 minutes and 2 nights and he is sleep trained. Praise the Lord. Weight: According to his 9 month appointment stats he weighs 18 pounds 8.5 oz making him in the 25th percentile for weight. Height: 28.5 inches making him in the 50th percentile for height. Size clothes: He is wearing 9 month clothes, but I just washed all of Aiden's old 12 month clothes so they're ready. Yay for the boy's sizes matching up this season! Sleeping: As mentioned above, this month has been my favorite month in the sleep department because hold the phone...Alder is actually sleeping through the night consistently. With a little sleep training that my husband forced us to do (I'm so glad) and BOOM...sleep! Nicknames: Big Baby, Baby J, Alder J and Aiden's nicknames continue "Lellow" short for marshmallow and "Lellow Popper" I don't know where he comes up with this stuff. 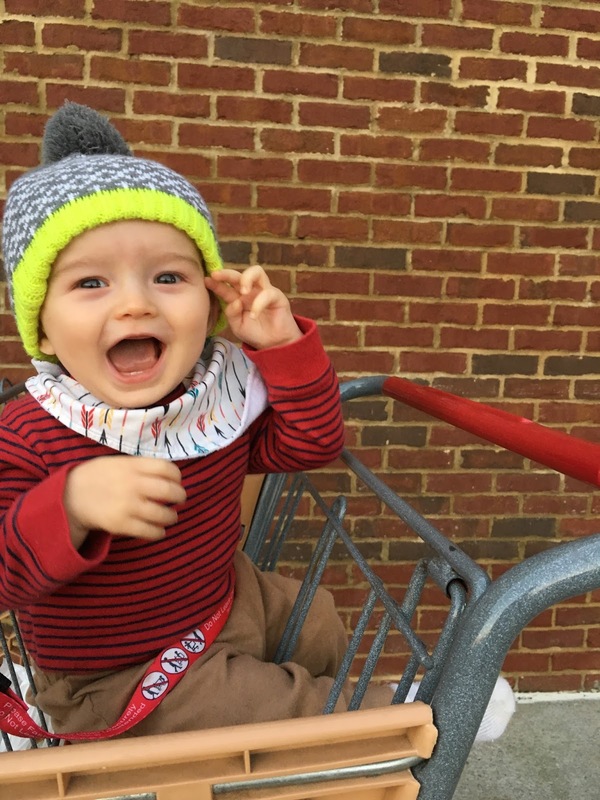 Likes: Being tickled, holding on to my hands so he can chase his brother around the house, feeding himself like a big kid, drinking out a sippy cup, saying Uh-oh, getting smooches from his Dada, dancing to music and clapping his hands. We love you to the moon and back baby boy. See Aiden at NINE months here! He has the very best smile!